An important part of any Project Management Report are the Project Issues which are covered in more detail in Project Management Issues. Essentially in your Project Management Report you should only detail the new, updated or important Issues. Unfortunately whilst this might seem quite an easy thing to do, the amount of detail required when an Issue is raised means this can quickly become an onerous task, as you will see below. After looking through the numerous columns which have to be filled in to raise a Project Risk, youre probably quite relieved to see that it is a much easier to raise a Project Issue. 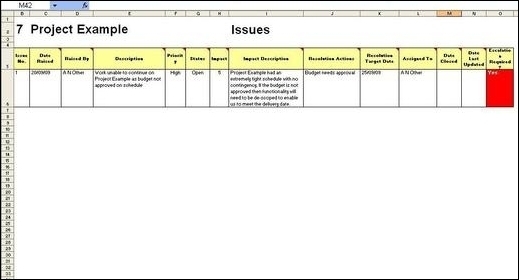 Further the Issues template tends to take a more common sense approach compared to the Risk template. Please note that at most Companies this will probably be the amount of work required to raise an Issue, as the example shown above is not a detailed as it was for Risks. This is the Number which you have assigned to the Issue. This is the date when the Issue was raised. This should be the name of the person who raised the Issue. Please note this is not the person who actually documented it in the Issues Register, but rather the person who mentioned it in the first place. "Work unable to continue on Project Example as budget not approved on schedule." This column is there to give the project board an idea of how important the Issue is. This can be particularly important if you have a large number of Issues raised as it will enable you to narrow in on the most important Issues and resolve them. In this column you need to state what the monetary impact to the project would be if the Issue materialised. So for example if an Issue was serious enough that the project were to be delayed from launching for 3 months what would be the financial implications? As with the Risks you need to select a number between 1-8 to rate how big a financial impact in terms of potential profit before tax the Issue would have on the project if it occurred. Obviously how these bandings are defined depends on the Company you work at. However as an example Rating 1 could equate to between $0 to $50k and Rating 8, the most serious could equate to $40m+. This is where you need to write down what Impact the Issue would have on the Project if it materialised. Please note that if you have given the Issue a high Impact rating then you need to write a really detailed and compelling Impact description to back up the rating youve given it. "Project Example had an extremely tight schedule with no contingency. If the budget is not approved then functionality will need to be de-scoped to enable us to meet the delivery date." This is where you detail who is taking responsibility for resolving the Issue. In many cases this will be the Project Manager, but in the example stated where the budget has not been approved this would be something which would be out of the Project Managers control. Therefore you would need to probably put down the Project Sponsor as who the Issue is Assigned To. This is the date the Issue was closed. This is the date the Issue was last updated ie with progress or further mitigation. This is usually calculated from the ratings you gave to Impact and Priority. In the example stated it determined not unreasonably that escalation upwards was required. After all if work cannot continue because the budget has not been approved, with the result the project may not be able to launch on the specified date then this is one of the most serious Issues a project can face. What would happen is that when the PMO went through all the Project Management Reports, Issues such as this which need escalation would be highlighted and then passed upwards to either the Project or Programme Board for discussion and resolution. If you arent sure what the Impact of an Issue occurring would be, then consult the business case and PID for the project. If the project doesnt have either of these, (and youd be surprised how many dont), then either use your common sense or consult the Project Sponsor. Dont just assign an Issue without talking them through it first and gaining their permission first. There is nothing worse than being in a Project Board, going through the Project Issues when someone says they not only know nothing about the Issue they have been assigned, but that theyre not in a position to resolve it anyway. It makes you as the Project Manager look a bad communicator and not someone who is in control of the project. Make sure you proactively manage your Issues. Dont just raise them and then forget about them as these will turn up later to derail your project. Lastly keep a very close eye and access to the Issue log. It never ceases to amaze me how many resources will simply raise an Issue in the Issues Log, forget to mention it to you and then later on will protest, but I raised an Issue about it. Its not my fault nothing was done about it. Worse still you could be in a meeting where you discover that your Issues Log doesnt have 20 Issues but 50, most of which you know nothing about! Therefore ensure that before anyone raises an Issue, they need to run it by you first so you can try to resolve it before it gets onto the Log. Being proactive early on will pay serious dividends later on in ensuring a successful project delivery.